Much like the winding river which runs through it – or near enough! – Tuakau has more than just a few twists in its tale, as amateur local historian, STUART GRAHAM, recounts. Since European settlers first arrived in our area – more followed from Ireland on pioneer ship, the Ganges, in 1863 and 1865, and 12 other vessels – many people have worked hard to make Tuakau a town to treasure. This semi-rural area is rich in assets and historic sites. Fertile soil has been key role in encouraging settlers to set down roots and much has grown from these roots. In its early years, Tuakau served plenty of dairy farms. Two large factories served them, although these have now closed. This aside, the land was mostly used to grow crops. Today, more land is being used for houses and businesses, with orchardists (for example) moving further south to make way for residential and industrial growth. The region is still home to plenty of lifestyle farmers, but not so many make a living from it. However, the local stock saleyards are huge and continue to serve the region’s farmers. No overview of Tuakau would be complete without mentioning the Waikato River. The town may be set to the north of the river, but this mighty waterway has always (in another way) been at its heart. The river was a major transport route, connecting Port Waikato with Hamilton. Now, modern roads and railways have superseded waterways for transport. 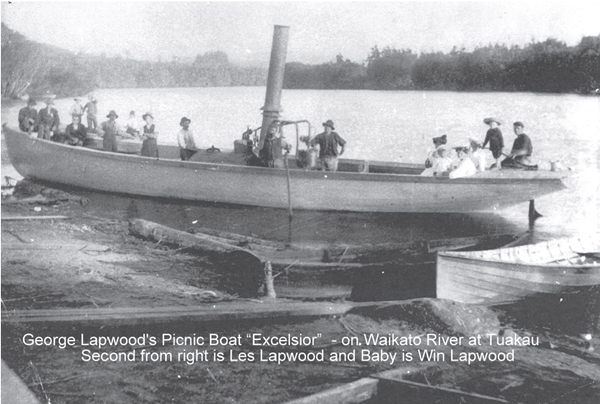 As a result, the Waikato has become more playground than worksite – paddle passenger craft, steam boiler boats, log canoes and large waka (all once commonly seen) have given way to jet skis, Sea Scout boats, waka ama and other recreational craft. However, it remains an essential link for whitebaiters and duck hunters looking to rustle up wild fare. In 1886 a cable punt crossing was implemented. In 1903 it was replaced by the first Tuakau bridge and, 30 years later, after this wooden structure collapsed, a concrete bridge was constructed. Due to its width, the ‘new bridge’ can (on occasion) struggle to cope with traffic, yet it has become a local icon. Unfortunately, while the main trunk railway line still passes through the centre of town, passenger services are no longer available. More locals are now urging Kiwi Rail to resume services asap – I’m sure this would help ease congestion on the overburdened Southern Motorway. While bricks and mortar, buildings and bridges, may be lasting legacies – and indications of a prosperous future – it ultimately comes down to the people of Tuakau which have (and continue) to make it such a splendid place to live. Over the years, Tuakau’s political duties have been attended to by various bodies, from the old Tuakau Town Board, to the Franklin District Council and, since 2010, the Awaroa ki Tuakau Ward, under the Waikato District Council. Yet, our identity remains solid; political boundaries may change but an identity which has been lovingly fostered over more than 175 years simply won’t be erased at the stroke of a pen! Our family has been in awe of the changes throughout Tuakau’s history, so much so we wish our Tuakau Museum had more space to display the many fascinating items which highlight who we were and who we’ve become. Today, four siblings in our family are the third generation to be born and raised in the area; their children now run family businesses including Tuakau ITM and Grahams Funeral Services. However, this article is not about our family alone. While there are many families who have contributed much, there are a few of particular note which should be thanked. The Batkin family have long held a huge stake in the chicken hatchery business, providing eggs and poultry products throughout New Zealand and the Pacific Islands. The Welch family has also been involved in egg production and grain drying products for many years. I must mention the Young family who has shown great faith in Tuakau by lovingly restoring the historic Tuakau Hotel (established in 1875). Thanks to their efforts, this grand old lady remains a hub of the district, providing accommodation and entertainment for locals and visitors. Similarly, the Jackson family deserves plaudits for giving a former monastic school a new lease on life. Now known as La Valla, the site has been transformed into a wonderful event and accommodation centre – including a theatre. Thanks to these families (and many more) Tuakau continues to thrive. It is blessed with parks and reserves, sport and service clubs, churches, schools and more. We have a large trucking firm, timber treatment and timber processing plants, various industrial concerns and businesses of virtually every sort. We benefit from all services needed for a growing population, even a retirement village. Since its early days, Tuakau’s cemeteries have become almost completely full. This is sad, in a way, but as a new burial ground is planned for construction on Whangarata Road, it’s just another indication of the new life which inhabits our town. Next articleWomen’s world can be a corporate world!